Combining epic history with family stories, Michael Korda chronicles the outbreak of World War Two and the great events that led to Dunkirk. This is a book you won't want to put down. Korda is a graceful and personable writer, well-informed, perceptive, always to the point. Step by step, he traces the long chain of blunders, misunderstandings, and entrenched prejudices that led to defeat on the battlefield ... Alone is the compelling story, told in illuminating detail and without the Imax din, of how they got there, and how they got away. ...Dunkirk has a particular distinction, one that Michael Korda captures in the subtitle to his fascinating and occasionally exasperating book Alone: Britain, Churchill, and Dunkirk: Defeat Into Victory ... With riveting detail and often pitch-perfect pacing of the dramatic tension of this early part of the war, Korda interweaves history, politics, geopolitical intrigue, backroom bargaining, generals, admirals, prime ministers and a führer, military strategy, and autobiography to tell the story surrounding those nine days ...are times when Korda’s re-creation is superb and panoramic... What is less satisfying is the parallel story of his family, whose occasionally unexpected appearances have the quality of a Dickensian non sequitur ...he may not be writing only about how Dunkirk embodied and foretold Britain’s solitary status in the world, but also how alone one 6-year-old boy felt when the world was at war. In Alone,’ Michael Korda revisits this perilous moment. But he has not written a book purely about the retreat. Korda, a former editor turned prolific historian and biographer, also looks at the larger strategic picture as Europe erupted into war in 1939. He chronicles the downfall of Nazi appeaser Neville Chamberlain and the accession of the more aggressive Winston Churchill ... With all this in play, it’s some time before the action really picks up. When it does, Korda tells an exciting story laced with eyewitness detail and a fine sense of drama ... To his credit, Korda dials down the romance of Dunkirk. It was bloody slog from start to finish ... Though Dunkirk has been rendered as largely an all-British affair, Korda gives neglected France its due. 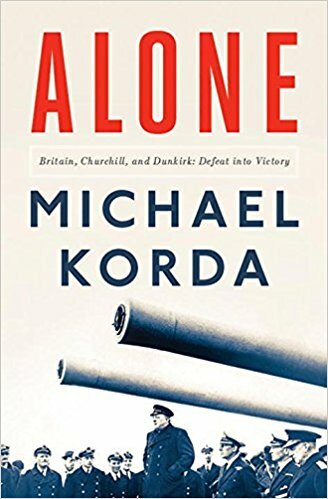 What did you think of Alone: Britain, Churchill, and Dunkirk: Defeat Into Victory?